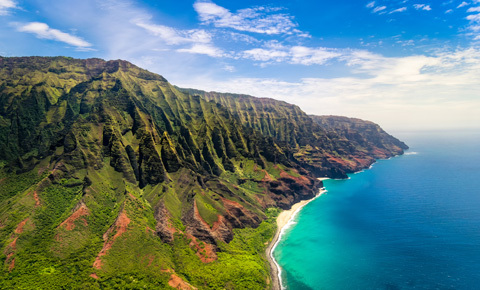 Escape to Hawaii – a tropical paradise – with California Tours’ Hawaii Vacation Packages! Whether you choose Waikiki Beach, Maui, or Hawaii, our three island vacations present a lush garden of delights and fun for all ages – whether you’re a nature lover, golfer, interested in ancient cultures, or energized by great shopping and nightlife, you’ll find your passion in scenic Hawaii. You can have it all here – snorkeling crystal-clear waters, hiking rain forests drenched by hidden waterfalls, and climbing trails leading to active volcanoes. Then, soak in the sun on one of the world’s best beaches, in a vacation fantasy land that’s full of flowers year-round. 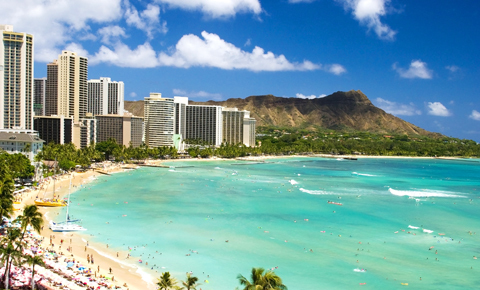 Hawaii’s most popular destination is Honolulu, the capital city on the island of Oahu. Shop at upscale boutiques in Honolulu, sunbathe and take in the nightlife at famous Waikiki Beach, or escape to the North Shore to watch surfers ride giant waves. 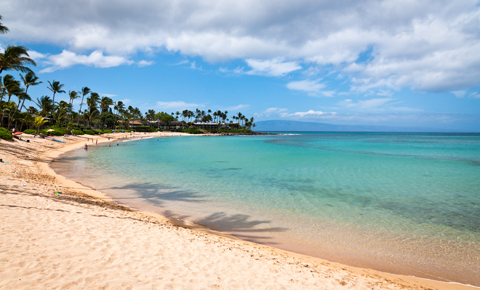 Our second package showcases the natural world of Maui, home to more of the world’s finest beaches. You’ll explore beautiful protected parklands in Haleakala National Park and Iao Valley State Park, and see Wailua Falls near the pristine community of Hana. Hawaii’s Big Island is the most diverse — and you can go from a lush rainforest to an arid volcanic desert in a matter of hours. You might even see an active volcano! Whatever island you choose, you are sure to have a relaxing and memorable vacation in the Hawaiian Islands. California Tours’ Hawaii Vacation Packages include flights and hotels, and can also include airport transfers, car rentals, and local tours and activities. The five-day tours to Maui, Waikiki Beach, or Hawaii are described in detail at the links below. Itineraries are just a starting point, and can be combined in any order and customized to any length. For each vacation, you may choose from the Classic Package, offering a carefully-planned, comfortable, and comprehensive experience, or a Deluxe Package, with additional options and upgrades. For the Hawaii vacation, use our Pleasant Holidays-powered booking engine to check rates for your travel dates, and don’t forget to add in a surf lesson or whale-watching cruise before you purchase! For all inquiries, including customizing your vacation package, please give us a call for the fastest response. We are able to take into consideration your travel dates, number of travelers, special requests, and more, into the quote request. You can also use the form on the right.